Life in Sassafras Springs has always been predictable, boring even, but one afternoon that changes when Eben McAllister's pa challenges him to find Seven Wonders in Sassafras that rival the real Seven Wonders of the World. The reward? An adventure that Eben's been craving -- a trip to Colorado. Even doesn't think he'll have any luck -- he can't think of one single thing that could be considered wondrous in Sassafras -- but he's willing to try. Little does he know that the Wonders he'll discover among his neighbors, friends, relatives, and family will give him the adventure of a lifetime...without ever leaving his home. 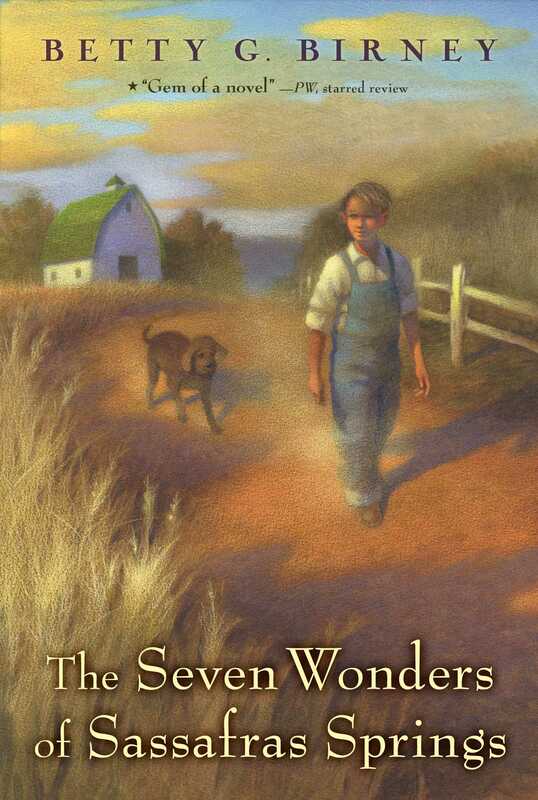 Twelve-year-old Eben McAllister dreams of faraway places after he reads a book about the Seven Wonders of the World. He feels doomed to stay on the farm and in his small community of Sassafras Springs until he grows up. His father challenges him to find seven wonders among his friends and neighbors in order to win a train ticket to visit a cousin in Colorado. • What do you know about the Seven Wonders of the Ancient World? Which ones would you like to be able to see? • What wonders exist in your community? How could you go about uncovering them? • Do you think you would like living in Sassafras Springs? Why or why not? If you could accompany Eben on his search for wonders, which person would you spend the most time talking to? Why? • Research the Seven Wonders of the Ancient World and make a diorama to show them. • Explore your community and compile a list of the seven most interesting ones you find. Make a display with photos, stories, or models for each wonder. • Eben was rewarded for his success by being able to go to St. Louis on the train. Imagine you earned a week's vacation anywhere in the world. Plan an itinerary and research travel arrangements, housing options, and sightseeing opportunities for this trip. Make a scrapbook of this imaginary trip complete with photos, schedules, and expenses. This reading group guide is for classroom, library, and reading group use. It may be reproduced in its entirety or excerpted for these purposes. Please visit http://www.emporia.edu/libsv/wawbookaward/ for more information about the awards and to see curriculum guides for other master list titles. Betty G. Birney is an Emmy-winning screenwriter who specializes in live-action TV, and animation for children. She lives with her family in Studio City, California.